I mentioned recently that Francie is very spooky. She freaks out of birds flying by, the sound of my voice, cars turning in the driveway. You name it - it might be spaz-worthy. I decided some desensitization was in order. 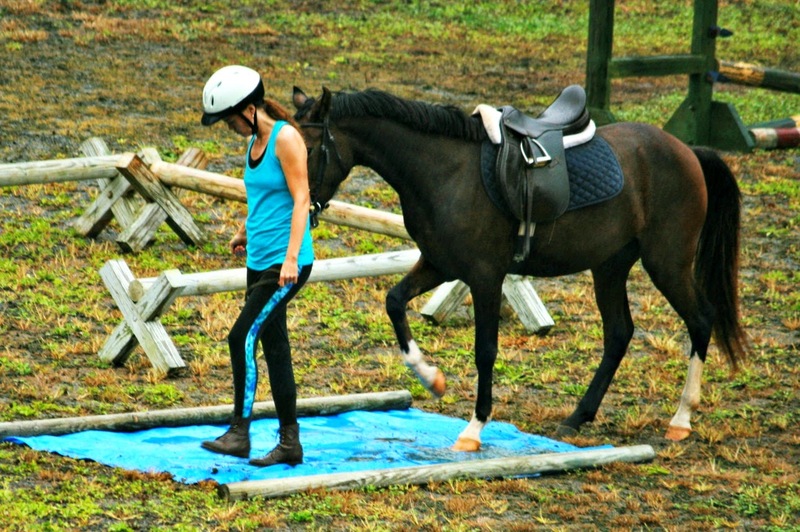 I remember doing similar activities with Phoenix when I was training him twenty years ago. I do this a little more gradually than some of the horse trainers, but I do feel gentle exposure to intimidating things is helpful later on. Also, just going through the process of facing the monsters with a horse helps to strengthen the trust bond. I created some 'scary' obstacles in the arena. Francie didn't have much trouble with my first creations, so I decided to up the scare factor. I went out and bought....a scary blue tarp. 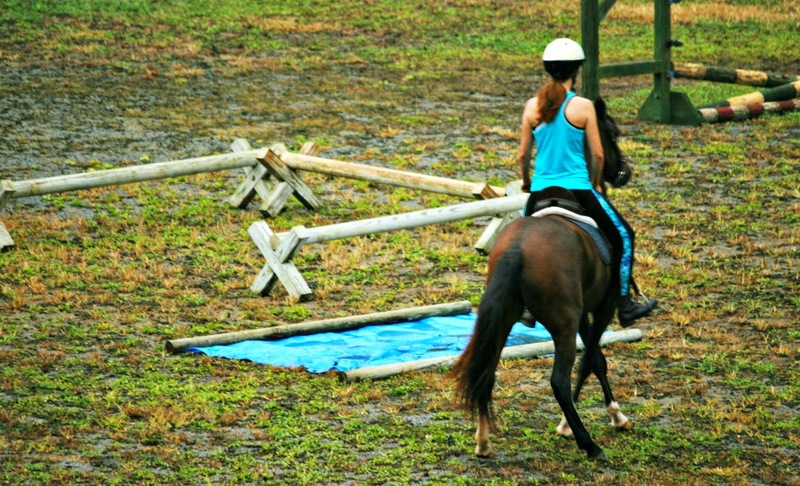 You can see - just riding by the blue tarp was terrifying. Francie wants to rush across everytime. 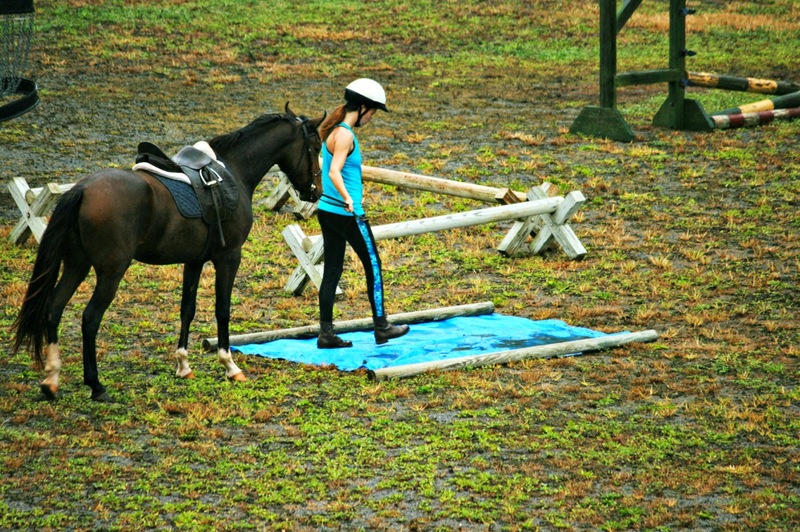 After a few days of repeated blue tarp exposure, Francie finally let me ride her over the tarp. Gentle, repeated exposure to intimidating things really does work. You don't have to force them. Just reassure, and keep trying. A little each day is fine, in my experience. A scary pool noodle contraption. Dusty can be scared of the strangest things an yet pays no attention to others. We don't want to talk about the dreaded piece of black plastic blowing on a weed, that evil thing that was the size of a cat looked just like a horse killing beast. She is beautiful and very lucky to have you. Good job. I see your shirt and pants had the same color. Was that on purpose to associate those colors with something she already trusted? Cavalry horses used to be trained in similar fashion. They had to be broken in to gunfire, small doses at a time. You are a real horse expert! I don't know how you come up with these things. It is scary to me, because she could have dumped you off in her fear. Please be real careful, Lisa. I can't help it, I am the mom of all bloggers! Looks like you have a good bond with the horse. I didn't know that certain colors bothered horses. I am learning! BTW, I like those boots you're wearing. She's beautiful! 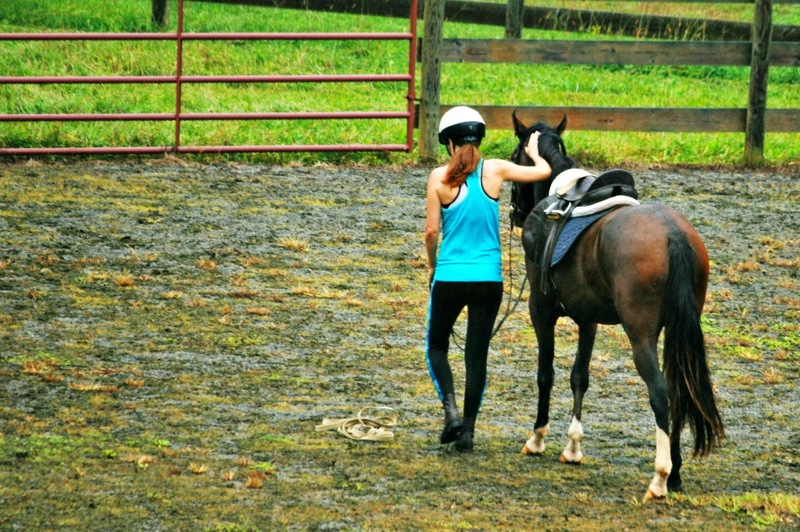 My horse was like that when I first got him. He spooked at everything! I really do miss riding. I just don't have the time anymore and my horse is an old man. 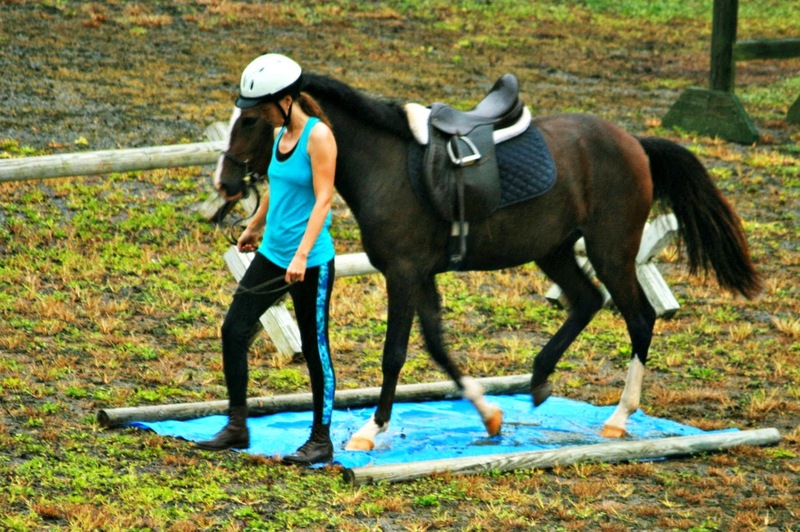 Lisa: This post brought me back to presentations I've seen with the desensitization program that the Scottsdale Police Mounted Horse Unit uses. I wondered if you witnessed that here in town? Similar to what you're doing. You're doing so wonderfully with her! bravo to the two of you :-) she is so beautiful. She is a beautiful horse. She's doing great! Wow. Amazing work...and that she is really coming around.